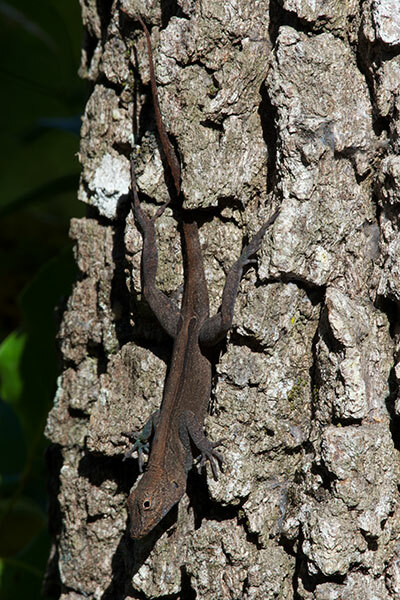 Another in the series of non-native anole species in south Florida. 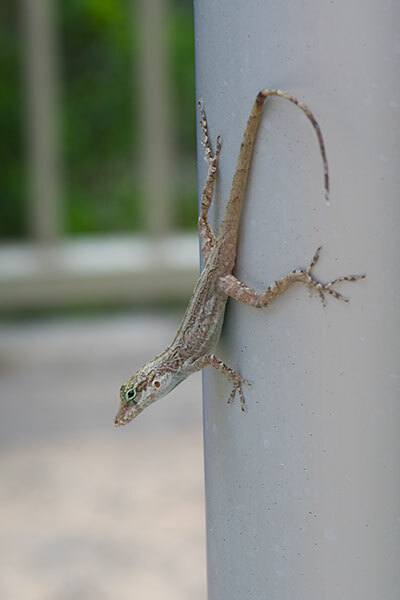 I saw many of these within the gates of a fancy-schmancy housing complex in pricey Key Biscayne; they were living the high life. 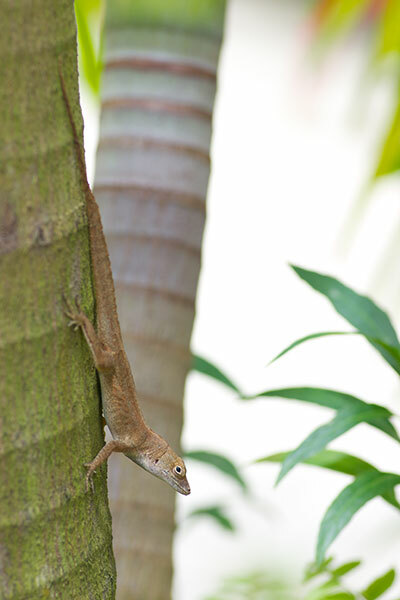 Each anole was initially head-down on the trunk of a large ornamental palm, a couple of feet off the ground. 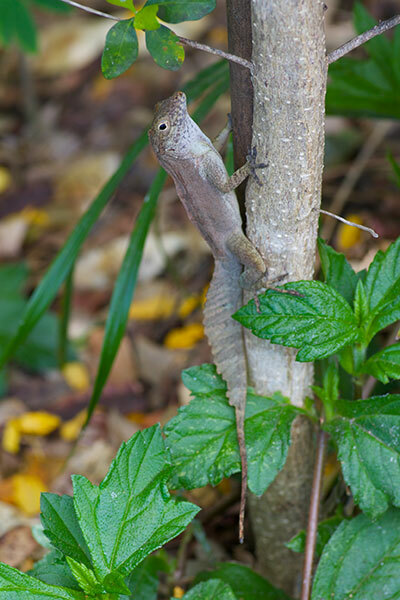 When they saw me with my camera, each turned head-up and rushed up into the fronds. 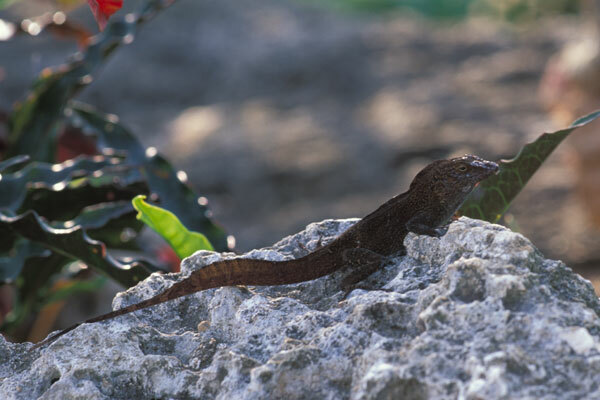 This one is a male, with a slight crest along its spine. Females have no crest at all. 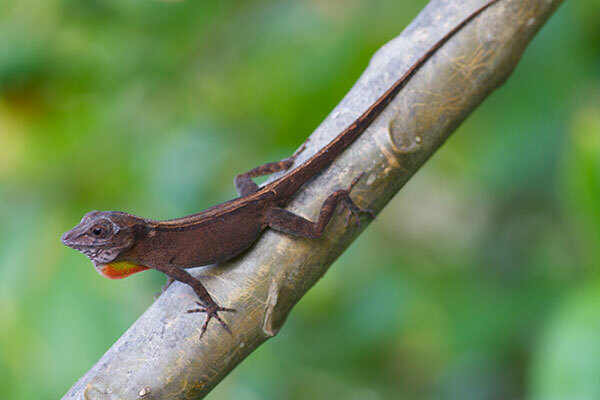 These largish anoles are not native to Hispaniola either. 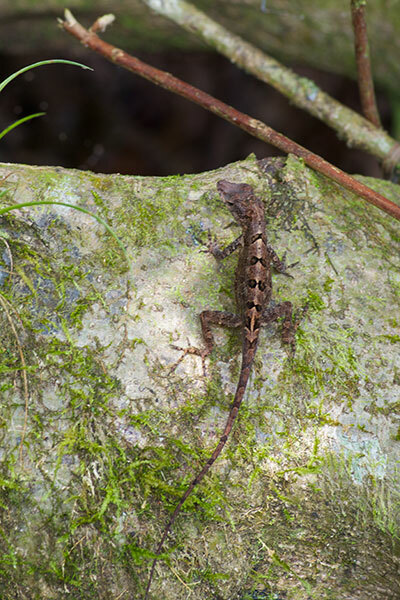 As the subspecies name suggests, they made the journey over from nearby Puerto Rico. 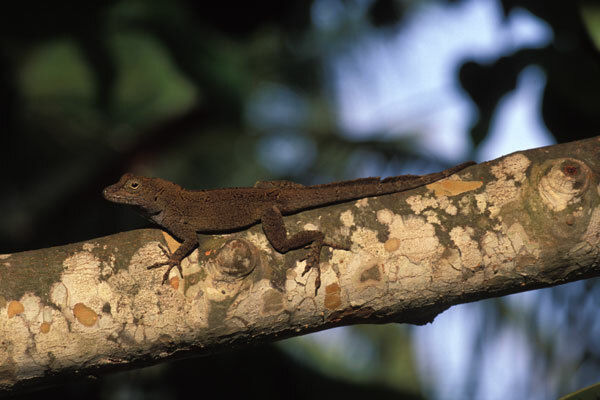 They are well established in southeastern Hispaniola, at least as common as the similarly-sized native large-headed anole. These two both have at least a small crest, and so are both males. 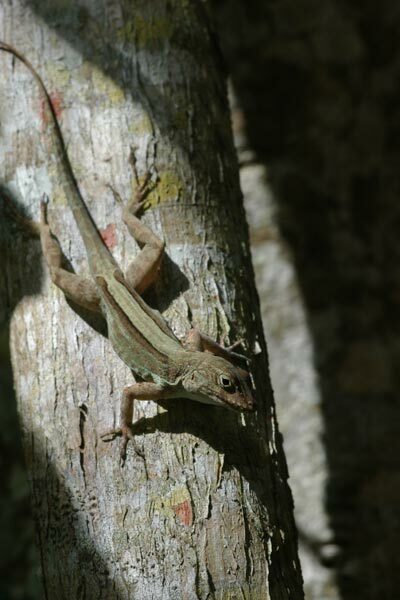 You can see how much the crest height varies even among adult males. 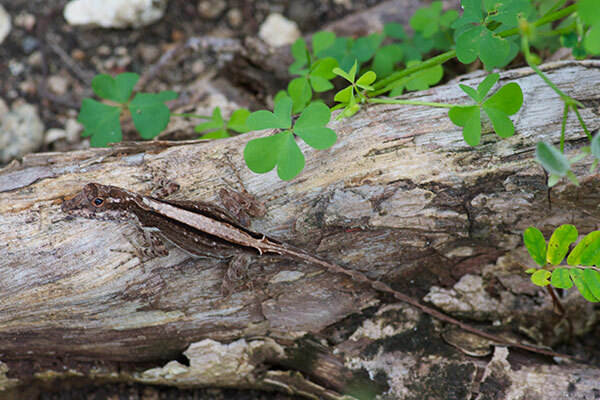 I chased around a pair of these large anoles for twenty minutes or so. 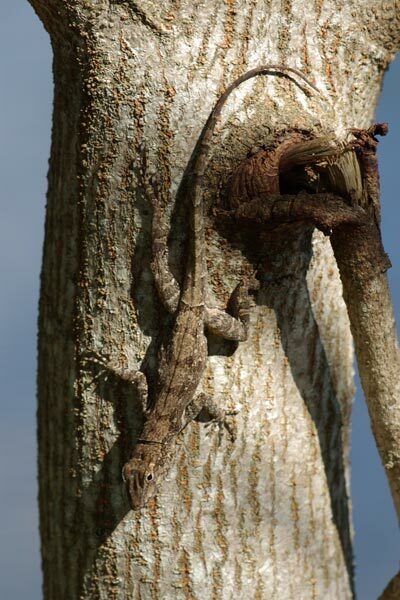 They never left the tree they were in, but they circled around it a dozen times or so, and climbed up high out of reach a few times too. 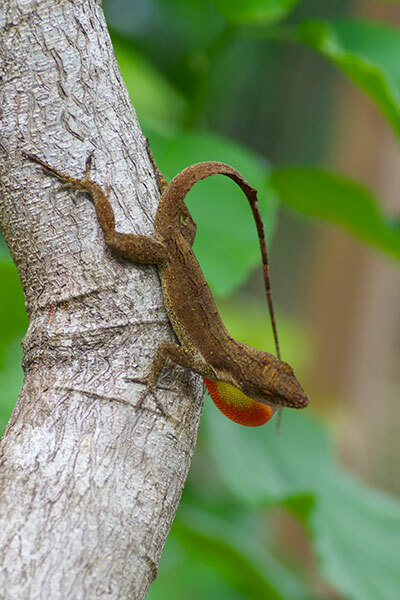 This crested anole is showing off an attractive dorsal pattern. 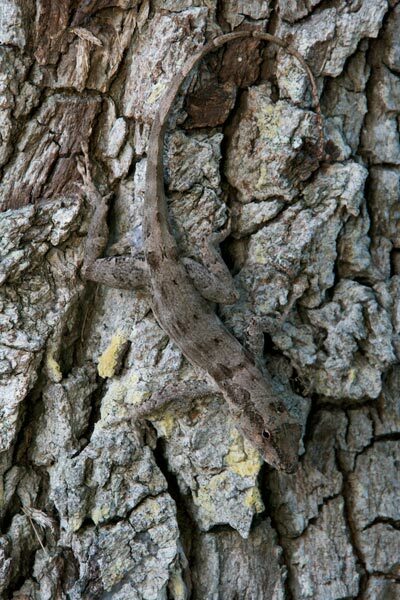 Here's another one in the same area a couple of years later, with another attractive dorsal pattern. 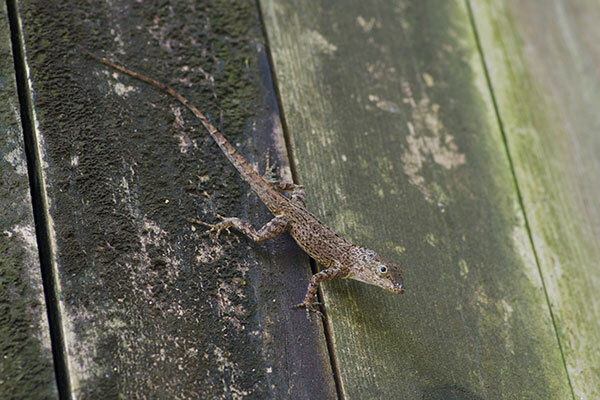 I suppose these last two could be yet another non-native anole species in South Florida, but I think they're just interesting variant forms. 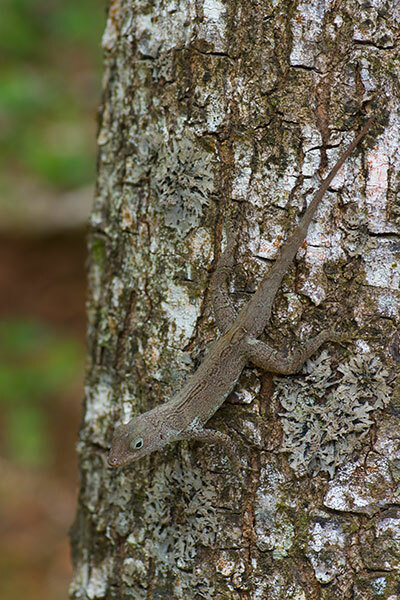 It seems I have a special kind of curse whereby I am doomed to take pictures of Puerto Rican Crested Anoles perching vertically on small tree trunks in Red Road Linear Park every few years. 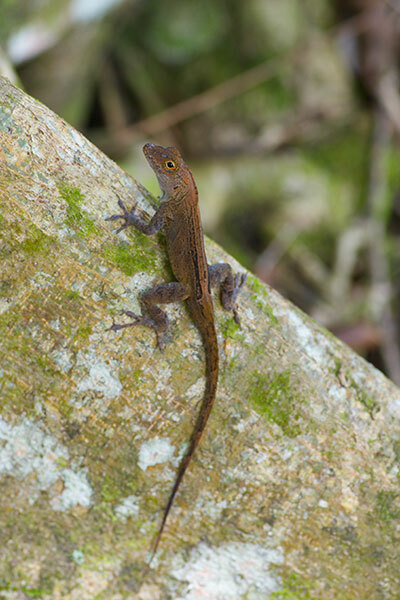 Here are a few of many more that I saw an hour or two later in El Yunque National Forest as my family members snacked at a roadside stand. 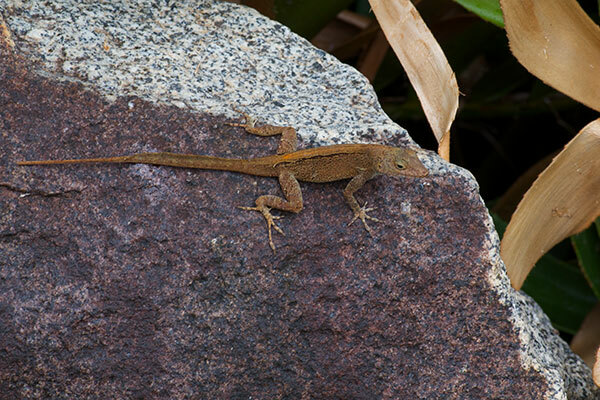 I'm not good at snacking when there are lizards to be photographed. 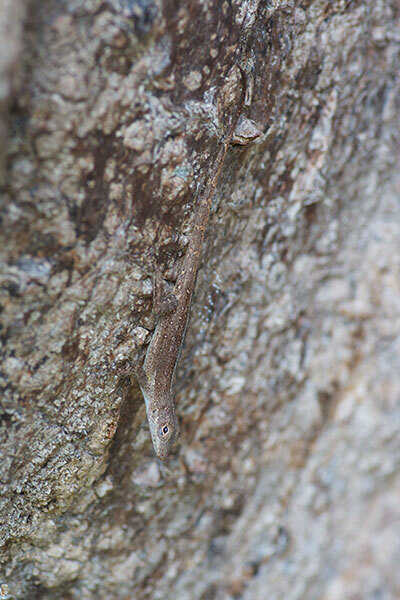 Note the diverse variety of patterns and shades in this species. 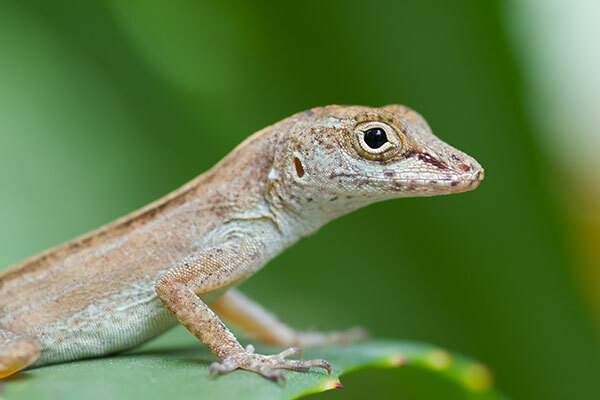 It's possible that some of the anoles I'm calling A. cristatellus are actually some other anole species. 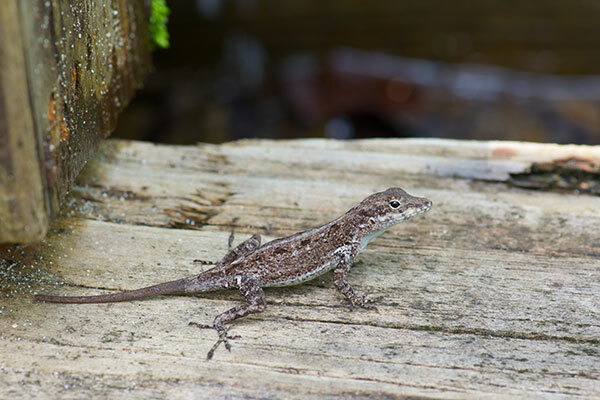 However, I asked for help identifying many of these over at Anole Annals, and some knowledgeable folks there were pretty confident that all the ones I asked about were indeed A. cristatellus. 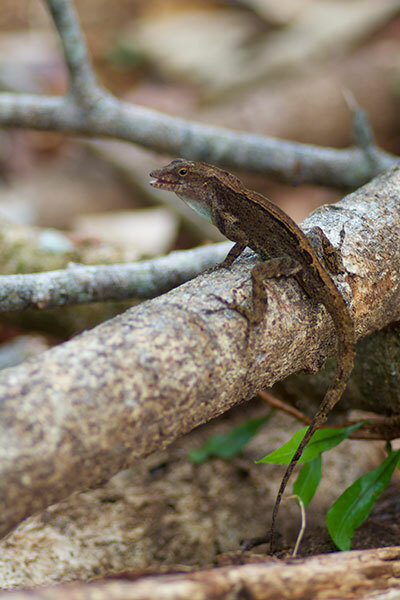 Another Anolis cristatellus that I suspected was some other anole species until the knowledgeable folks at Anole Annals set me straight. 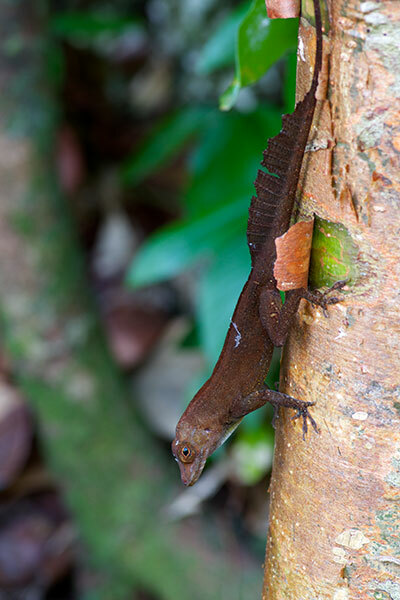 This one, a female or juvenile, has a broken-but-not-broken-off tail. Another assortment of textures and shades of brown from the next day. 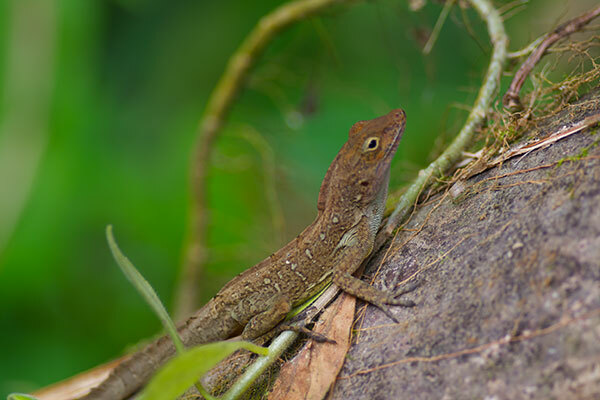 Puerto Rico has more than a dozen anole species, so you can forgive me for thinking that these lizards were possibly not all the same species. But it seems that they really are. While my wife and I were waiting for my mother-in-law and sister-in-law to join us at this museum of the so-called "Ponce de Leon House" (which disappointingly turned out to never have been occupied by the famous member of the Ponce de Leon family, Juan, but rather by various relatives; Juan himself went off and got himself killed in Florida looking for the fountain of youth while this house was being constructed), I spent my time productively photographing anoles in the courtyard. 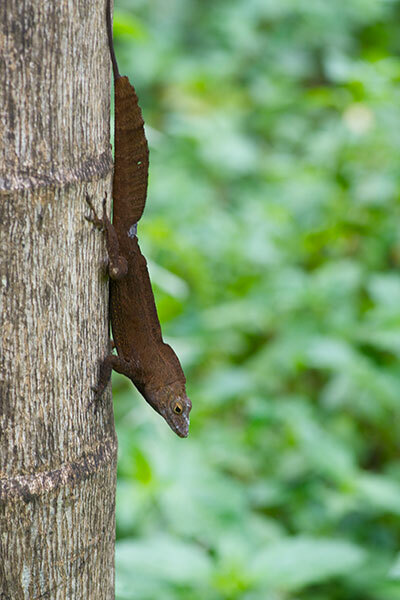 They seem to have all been Anolis cristatellus, again. 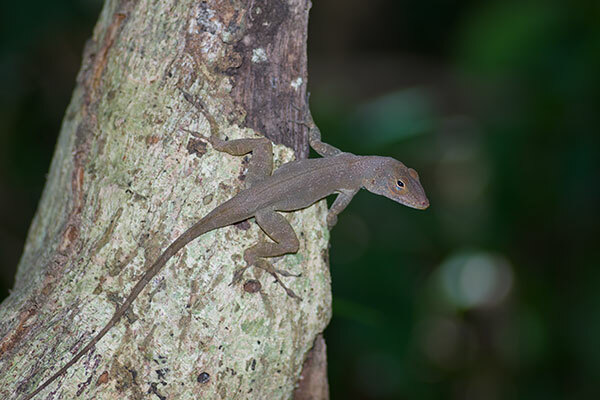 If there is one thing that I learned on this trip, it is that it is not hard to find Puerto Rican Crested Anoles in Puerto Rico. 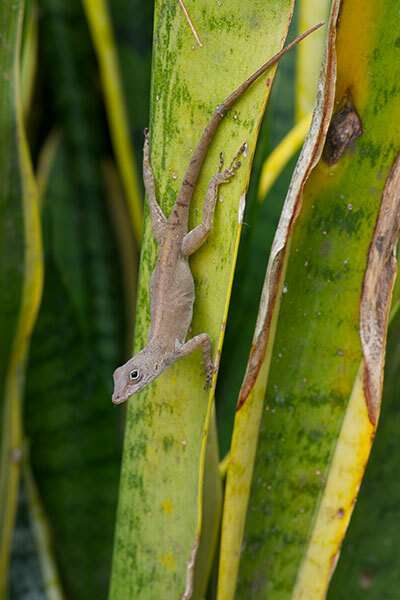 When our cruise ship landed at St. Thomas for a day, I studied the cruise dock info to see if there was any place within walking distance that might have enough vegetation to support a little wildlife. The Butterfly Garden sounded promising, and was close enough that my somewhat infirm mother-in-law and sister-in-law could both reach it pretty easily. It turned out to be a good choice; it was a small oasis of vegetation in a vast ocean of concrete. Outside of the netted butterfly house itself was a small native-plant display proudly boasting the title "Botanical Garden". 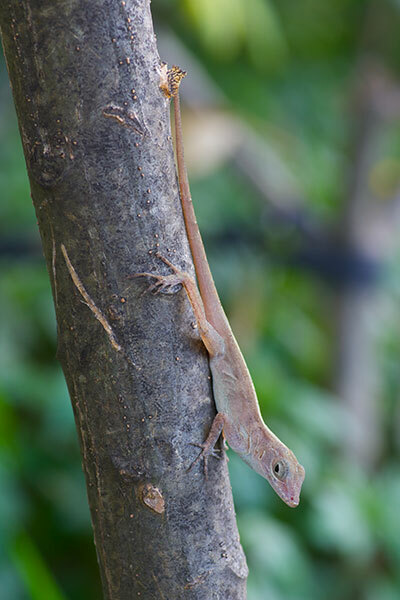 Due to torn and poorly-tucked spots in the netting, plenty of anoles frolicked inside as well as outside. 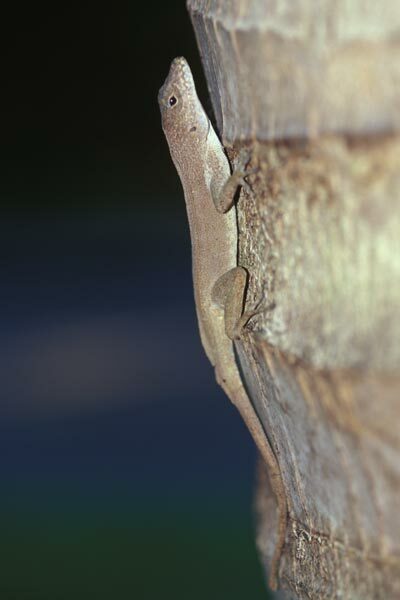 These anoles are considered sufficiently different from the ones on Puerto Rico to merit their own subspecies.